UNPO's May Newsletter is here! 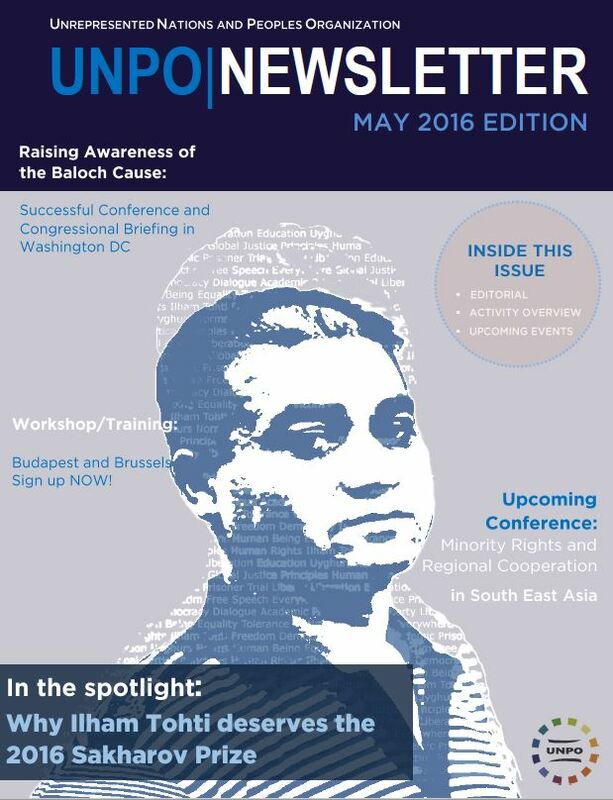 In the month of May, UNPO put a spotlight on the fate of Prof Ilham Tohti, an Uyghur economist and writer well-known for his peaceful work to build bridges and create dialogue between Han Chinese and Uyghurs, who was imprisoned in 2014 and sentenced to life on false charges of ‘separatism’. UNPO, together with its partners, took a conference at the European Parliament on the plight of Uyghurs in China in general and on Ilham Tohti in particular as an opportunity to launch his candidacy for the 2016 Sakharov Prize. In addition to that, UNPO, being a fervent supporter of the Baloch peoples’ relentless struggle against state-sponsored oppression, organized a variety of activities on that matter in Washington DC. A conference and a Congressional Briefing on the human rights situation in Balochistan were successful in raising awareness of the worrying and deteriorating situation. UNPO is particularly happy about the early release of Mauritanian anti-slavery activists Biram Dah Abeid and Brahim Bilal Ramdhane, who were arrested in November 2014 during a peaceful anti-slavery march and later sentenced to two years in prison. The whole judicial process, which was thoroughly reported by UNPO, violated several procedural laws and during their detention the two activists were deprived of many rights normally recognised to prisoners. To read more about our past and upcoming activities, download the May edition of the UNPO Newsletter.